Pedestrians and transit riders in North Portland may have noticed a new place to relax and rest their legs while waiting for the bus. 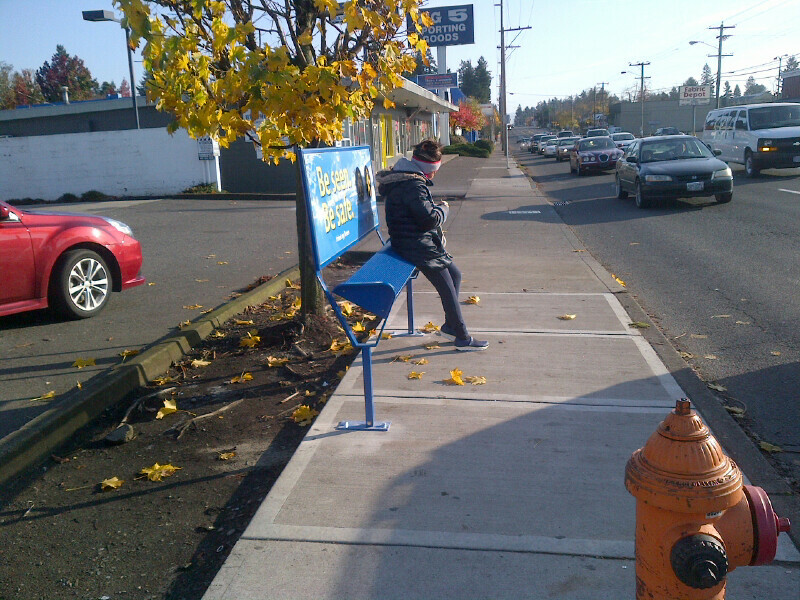 New benches and leaners are currently being installed as part of TriMet’s Ridership Amenity Program. This Ridership Amenity Program, funded entirely by Lamar Advertising, has completed the first round of bench and leaner installations along the Line 75. This work was completed in late December 2013 and January of this year following a short prototype test and public comment period. The second round of installations is taking place now in North Portland along the 4 and 44 bus lines. Bus Line 77 will be the next line to see new benches installed after that. The new leaners are similar to the leaner rails found at MAX stations, giving riders an alternative to standing in locations where benches will not safely fit. The design profile is shallower than traditional benches from front to back. This new design allows for installation of rider amenities in areas where sidewalks are not wide enough to meet the Americans with Disabilities Act (ADA) sidewalk standards and accommodate a traditional bench. 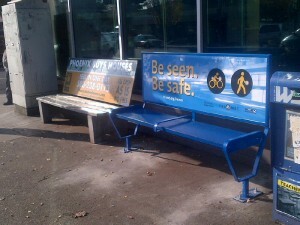 In November of last year, TriMet implemented an advertising contract with Lamar Advertising Company. The Lamar-funded program will replace roughly 600 existing ad benches with both benches and leaners. These new rider amenities are more durable and more easily maintained than the older concrete and wooden slat benches. Unlike the old benches the new benches are being secured or bolted down to the sidewalk or a concrete pad. A local woman-owned business, Decorative Metal Services, Inc. out of Vancouver, WA, is fabricating all benches and leaners. Installation will continue through December 2014 throughout the transit district. All costs, including TriMet employee hours spent on project, are covered by Lamar. Dimensions of advertising space will be the same as that of our buses allowing the panels to be interchangeable. New benches and leaners will be made of more durable materials, reducing maintenance costs. New benches and leaners will be secured in place, reducing unintended behaviors. Advertising on transit property helps fund transit service. Lamar guarantees TriMet between $3.2 million to $3.7 million in revenue each year. You no longer need to stop at the ticket machine or a retail outlet to get your fare! Our new TriMet Tickets mobile app lets you easily purchase and use tickets and passes instantly on your phone – anywhere, anytime. Just download the free app, register your debit/credit card in our secure system and you’re ready to buy, activate and go. Learn more at trimet.org/mobiletickets.